The client had a very clear brief which included the use of indigenous plants and drought tolerant natives in a way that was sympathetic to the house and neighbourhood. They also wanted a new entertainment area and a pond. The construction of the project was completed and then Botanical Traditions planted out the garden. The clients installed the irrigation system. The finalised design consisted of an area of permeable surface outside the main doors to allow as much water as possible to remain on site, a Australian hardwood timber deck, a pond which fills from a diverted down pipe, a stone chair, and a pathway that links the deck area to the inside entertainment area. As the site had a significant level change, terraced areas were introduced and permeable paving installed alongside the windows in the lower area of garden. Every year, AILDM runs a national design competition to recognise the achievements and design innovations of its members. The award showcases the very best gardens and landscapes across the country, and the nine categories are hotly contested. We entered this garden in Category 1 - Residential Under $50 000. Nominated as a finalist, we proudly accepted a Highly Commended award for our entry. 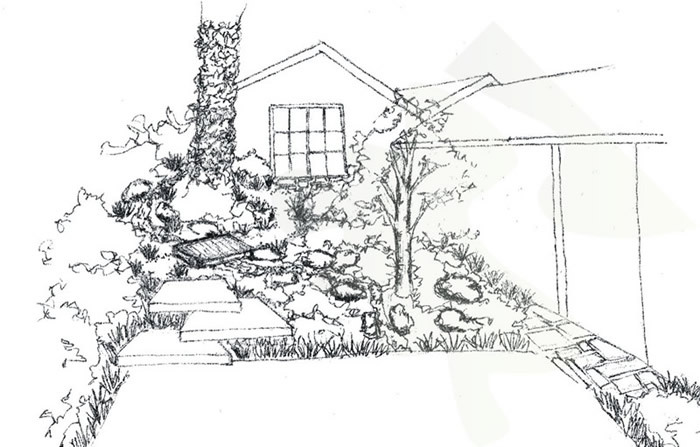 The winning entries were featured in the Backyard Garden Design Ideas magazine Issue 9.5.